Sadly, this particular Gulfstream was nothing to do with the rarified world of luxury executive jets but was rather more prosaically a subsidiary of Canadian company Bytec. The Hyperion portable was also known as the "Ajile", which was sold by Anderson Jacobson, a company better-known for acoustic coupler modems. This re-sale agreement had been made with the original manufacture of the Hyperion - Dynalogic - but hadn't been mentioned when Dynalogic sold out to Bytec, so there was some confusion when Anderson Jacobson discovered that Gulfstream was also selling "their" machine in to the same UK market. It also led to the firing of Anderson's PR firm, Patria Design, which had issued a press release entitled "Ajile versus Hyperion" which included the offer of a 20% discount on the Ajile and incurred the wrath of Gulfstream. Despite Patria insisting that the press release was approved, AJ's managing director, one Brian Warrington, denied everything. 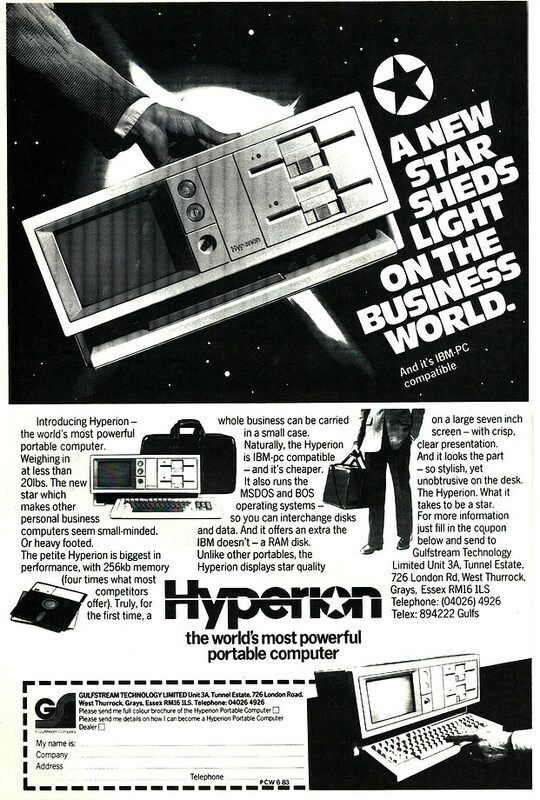 The Hyperion was also later sold as a re-badged Commodore, following the signing of an agreement which also gave Commodore the rights to second-source Intel's 8088. This crucially meant that Commodore could now produce its own IBM-compatible micros - Commodore was vertically integrated and didn't like anyone else producing stuff it relied on. Commodore's version of the Hyperion was first shown during 1984's Hannover Fair. Oh, and photo of some dude hauling the thing around whilst wearing a suit? Check.